The art of photography has been around since the 1800′s. For over 200 years, people have used photographs to capture moments in their lives that are important such as the birth of a child, or recording how their child has grown from a baby all the way to when they leave the home. However, photographs have also been used to take images of remarkable objects that change history. Once such object that was photographed was the RMS Titanic, and the ship had a tragic ending, which is why pictures of her were treasured. Here are 5 more pictures of the RMS Titanic both before she sailed, while she was at sea, and when she was discovered underwater in 1985. 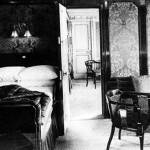 First Class passengers were given the choice of a suite, and for those that wanted the utmost in luxury to stay in, there were a few parlor suits on B-Deck. 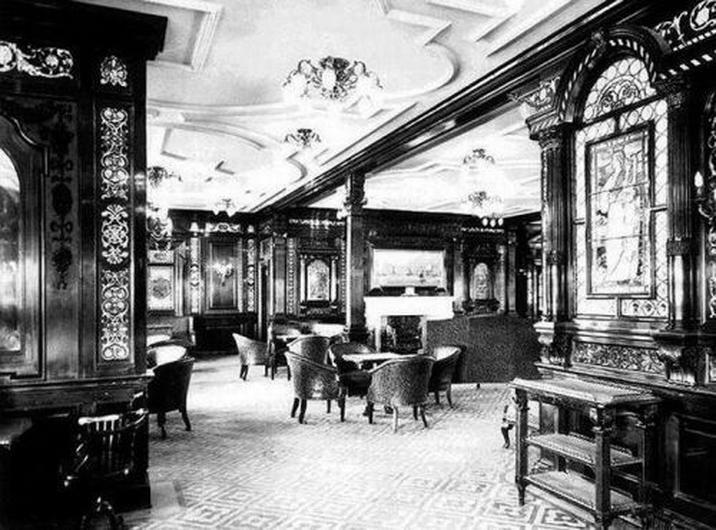 One of these fancy suites, which had its own private promenade, was occupied by J. Bruce Ismay, the managing director of the White Star Line. 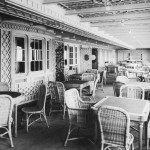 The suit had two bedrooms that were joined, a fireplace, a table with two chairs for writing, and many other amenities not found anywhere else on the ship. 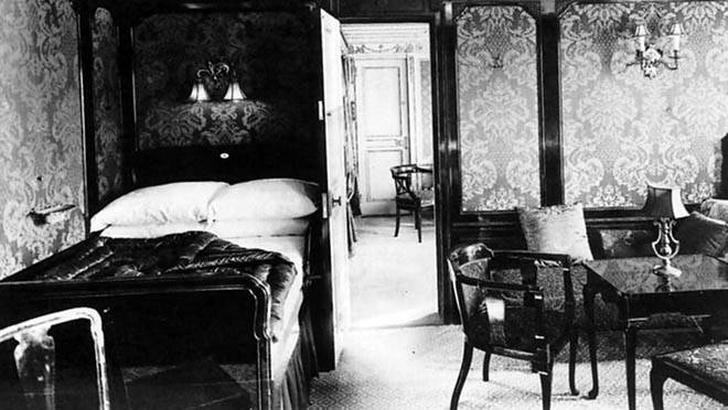 This suite was so luxurious that it cost a total of about $43oo dollars in today’s money. 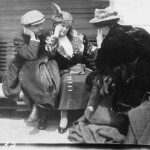 Back in 1912, men and women were not seen as equals in society. Men were the bread winners, and women were the ones who took care of the home and children. Women who were in First Class, were not the ones who did manual labor, but they were taken care of by their husbands. 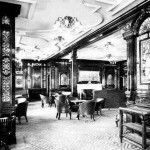 Even on board the RMS Titanic, men and women had their own special places on the ship. 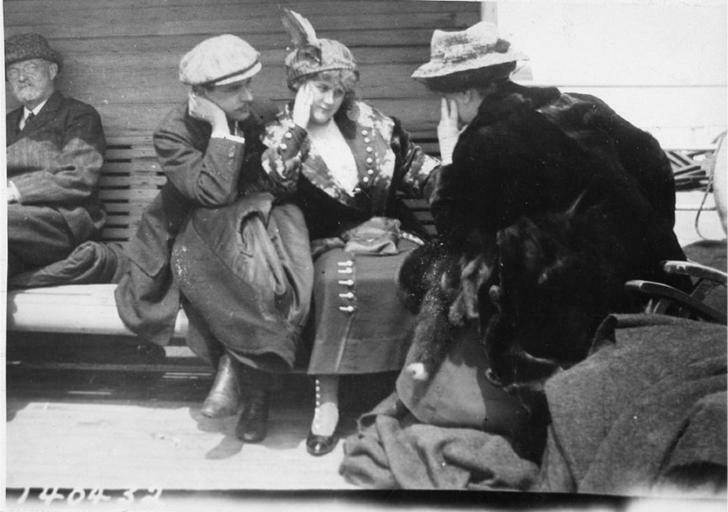 Women had a reading and writing room, and men had the First Class Smoking Room that was located on A Deck. The room featured a painting over a big fireplace, stain glass windows, and hand carved wooden designs that were all over the room. In this room, men could not only get together and talk business and politics, but also have a drink, smoke a fancy cigar, and even play games like Baccarat and cards. This was a room where men could relax, enjoy themselves, and even talk a little business without having to worry about offending anyone. When the RMS Titanic struck an iceberg, she began to sink before midnight, but it was not widely known that the ship was truly doomed. The bridge officers knew Titanic was going to sink, but it was not told to the passengers because Captain EJ Smith did not want to cause a panic. The women and children were put into lifeboats, and when they were rescued by Carpathia, the women firmly believed their husbands would be put into lifeboats too or simply could not believe the Titanic was going to sink. While on the Carpathia, the women were waiting for their husbands to show up, but eventually, they had to come to the realization they were widows. The above image was taken on the Carpathia, and it pictures some of the widows who were dealing with their loss, and what was going to happen to them next. 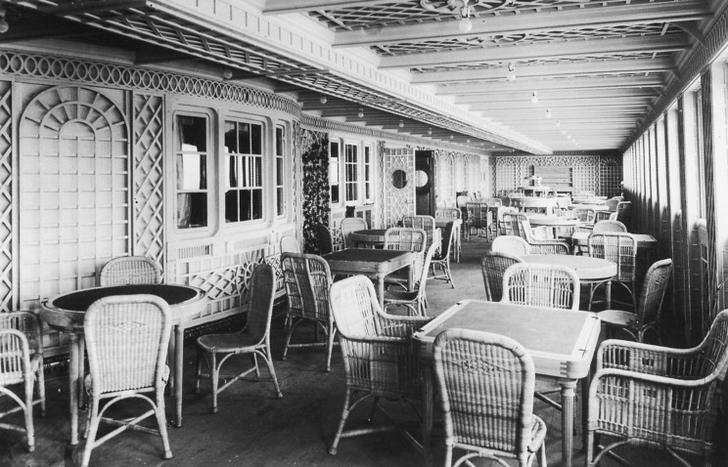 For those First Class and Second Class passengers that wanted to dine more al fresco, the Care Parisien on B Deck offered a more outdoor-style dining area with a limited light menu. The windows provided sun pouring into the cafe, and the tables and chairs were made of wicker, the theme of the room with its white paint was like dining at an outdoor cafe in Paris, France. 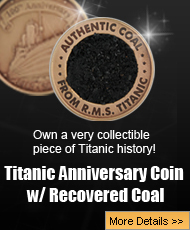 On September 1, 1985, a man named Dr. Robert Ballard, and his crew on the research vessel Ifremer, located the lost wreckage of the RMS Titanic. 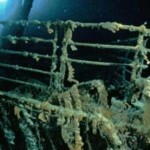 One of the very fiew images Ballard took of the lost liner was the bow, and it is the famous picture seen above of the Titanic’s bow covered in rusticles. 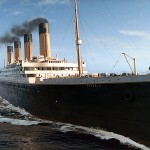 This image of the bow was the very first time human eyes had seen the Titanic in 73 years, and her condition left many students of the disasters in shock. After all, the Titanic was brand new when she sank, but 73 years underwater had taken its toll on the once beautiful ship transforming her into something almost unrecognizable. Photographs are moments in time that are permanently captured on film. The art of taking pictures has been around for a couple of centuries, and while some photos are of moments in people lives, some are actually moments in history. 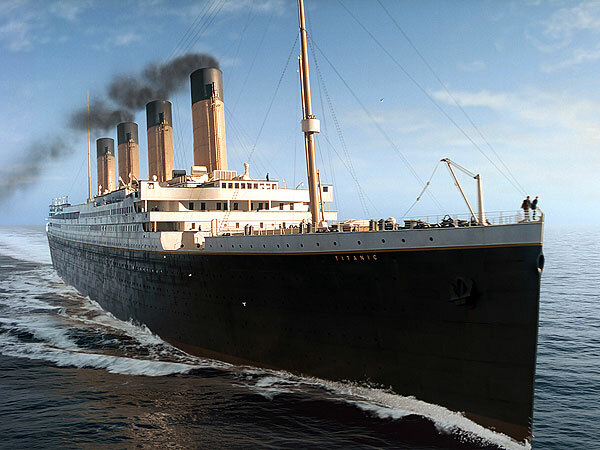 These pictures presented here were of the RMS Titanic both before and after she sank into the freezing cold waters of the North Atlantic, and there are more pictures of this amazing ship that will come in future posts. The Titanic may be gone, but photographs of her will keep that stunning ship in the hearts and minds of those that study her forever. Next post: Titanic Conspiracy Theory: Did JP Morgan Cause the Sinking?